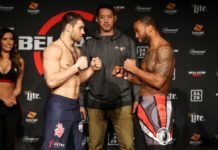 The MMA Gods are fickle, and heading into Bellator 218 this Friday, not one but two fights have fallen off the card, as Mike Shipman and Jeremy Hardy are out. A late shakeup to Bellator 218 has seen a middleweight scrap lost from the show’s main card. And the heavyweight fight to replace that has also fallen through. It’s a bizarre turn of events for this Friday’s card. The first blow came as middleweight Mike Shipman, who was expected to make his much anticipated return against Hracho Darpinyan, fell out due to injury. Bellator officials reflected the change on the official fight card following an initial report from MMA Junkie. Originally, the plan was to have Jeremy Hardy vs. Rudy Schaffroth promoted to the main card, as no replacement could be found for Derpinyan. However, that heavyweight fight is now off as well, as Hardy was involved in a car crash. An MMA Junkie report on that mishap noted that Hardy vs. Schaffroth was set to be replaced by Will Lavine vs Norbert Novenyi at middleweight. Hardy, who was looking to bounce back from a loss under the LFA banner last time out, later addressed the incident on social media. “I’m blessed to have some amazing [people] in my life. Thank you for all the visits and well wishes. F*ck the 2 cars who decided to cut me off and smash on their brakes half in the lane/half on the shoulder. Took the earth to finally hurt me and I’m still good. It def could’ve been worse and I’m so gracious to still be here to write this post,” the fighter wrote. The good news is, Hardy seems to be in good spirits. The bad news, those pesky MMA Gods have seen fit to strike two fights off the Bellator 218 card.